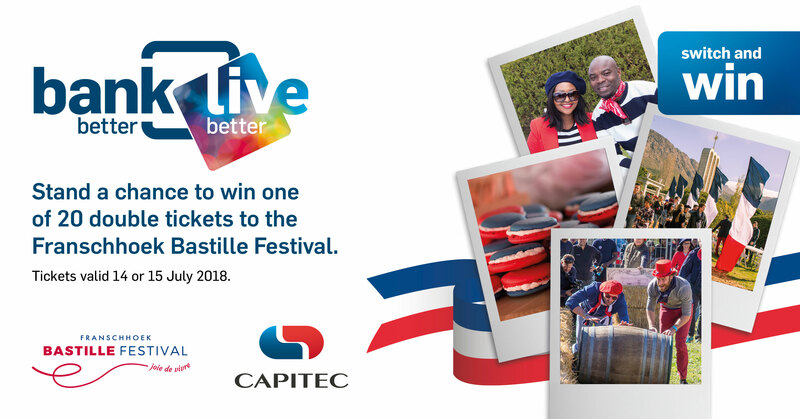 Stand a chance to win one of 20 double tickets to the Franschoek Bastille Festival with Capitec Bank. SA’s French inspired 25th annual Franschhoek Bastille Festival, which takes place at the historic Franschhoek Huguenot Monument on 14 and 15 July. T&C’s Apply. To qualify, do any one of following between 1 – 30 June 2018. Visit capitecbank.co.za for the competition rules and a list of participating branches.